This is one of the longer par 4s usually played into a prevailing wind and the safe driving spot to aim for is the right side of the fairway. Waiting to collect the errant drive there is a pond to the left bordered by long rough which makes a long second shot from here almost impossible. The ground also falls away to this area which often leaves the ball above the feet making the approach shot all the harder. With out of bounds markers on the right denoting the Cole Stream course boundary accuracy is key to the second shot placement. 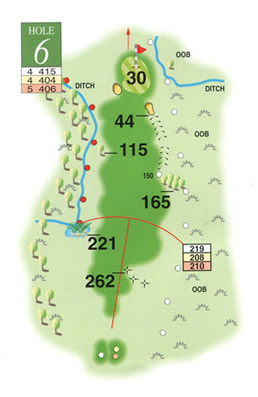 There is little room on the right between the green and out of bounds so centre or left of green are the favoured target areas, though a clever ruse is to chase a running ball up and onto the green in firmer weather. There are hidden undulations on the green so care is needed in selecting the right line to avoid three-putting. A good testing hole though at any level.